During your house hunting times you definitely browsed the realtor’s offer for discounted properties or attractive bargains. You probably always hoped to be able to buy that special home at a great price. Well, here is your chance to buy a true bargain, in the shape of a spectacular mansion in New York’s Upper East Side area. After languishing on the market for more than 9 months with a mind blowing price tag of $114 million, the owners decided to have it discounted to a mere $98 million, according to The Corcoran Group, the company that is in charge of selling the home. The mansion is listed at 20,000 square feet of living space, including 2,500 square feet of outdoor space and has an annual property tax of $178,246.Located in the prestigious Upper East Side of Manhattan, the mansion features a stark limestone facade covering six levels of extraordinarily sculpted interiors, inspired by historical landmarks as Palace of Versailles and the Palazzo Farnese in Rome. The home offers splendid views of the Central Park and the Manhattan fabulous skyline and features luxurious amenities like an indoor heated saltwater pool, a spa and a panic room. Built in the late 19th century, more precisely in 1883, the mansion has a front facade spanning over 40 feet in width, offering absolutely incredible interiors, with seven bedrooms, six bathrooms and three boudoirs or powder rooms. Unfortunately, the facade was stripped of the limestone details during the 20th century, when it housed private medical offices. The building, which was poorly maintained, was bought by Teresa Viola, and transformed in a fantastic palace, featuring luxurious materials and high ceilings, ranging form 12 to 34 feet. The renovation of the building began in 2005 and lasted for three years, during which the kitchen was completely redesigned, featuring four huge mahogany framed windows overlooking the Central Park, a pizza corner brick oven, brick decorative walls, Viking ovens and three granite sinks. The floor is made of unique reclaimed railroad ties which were sliced and finished with lacquer. The makeover included expansive trips done by Ms. Viola to worldwide suppliers of exotic materials. From choosing the perfect onyx colors and shades, to choosing the best ceramic tiles from Italy, or the grand furniture of the dining room, she oversaw the whole process closely. The ceiling of the duplex library was painted by a famous artist from Ireland and features a wonderful fresco rendition of Kipling’s poem “If”. The staircase, a grand design adorned with Italian granite, has mahogany sculpted banisters, the side walls are decorated with gold filigree, displaying multiple designs. The living room has Brazilian travertine clad fireplace, a Juliet balcony facing South and a coffered ceiling, all reminiscent of the heydays of the Italian Renaissance. IF this doesn’t sound impressive enough, there is a banquet room on the third floor, featuring a heated black walnut floor, lined with pink marble detailing. The bedrooms have en-suite baths on the third and fourth floor, but the fifth floor houses the master suite. The master bedroom has two baths, his, decorated with onyx, and hers, decorated with rose quartz. Also, there are two dressing rooms for each master owner. The lower levels feature entertainment areas, a recording studio, a completely equipped gym, a pool and a sauna. With winter coming in just a few months, going home and sitting by the fireplace has changed its meaning altogether. 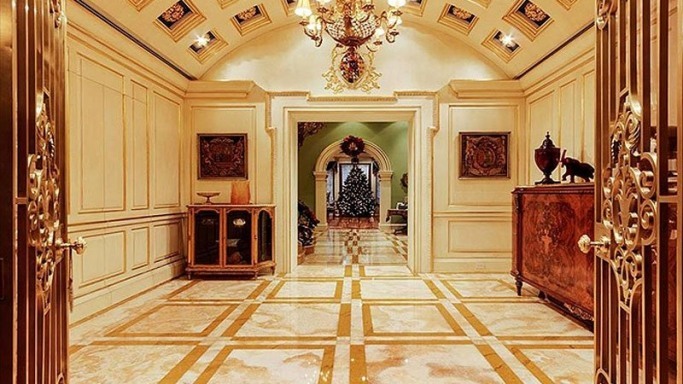 The outstanding luxury of this mansion is absolutely irresistible for any urban dweller and it certainly isn’t the type of residence that would require shoveling snow or ordering pizza.